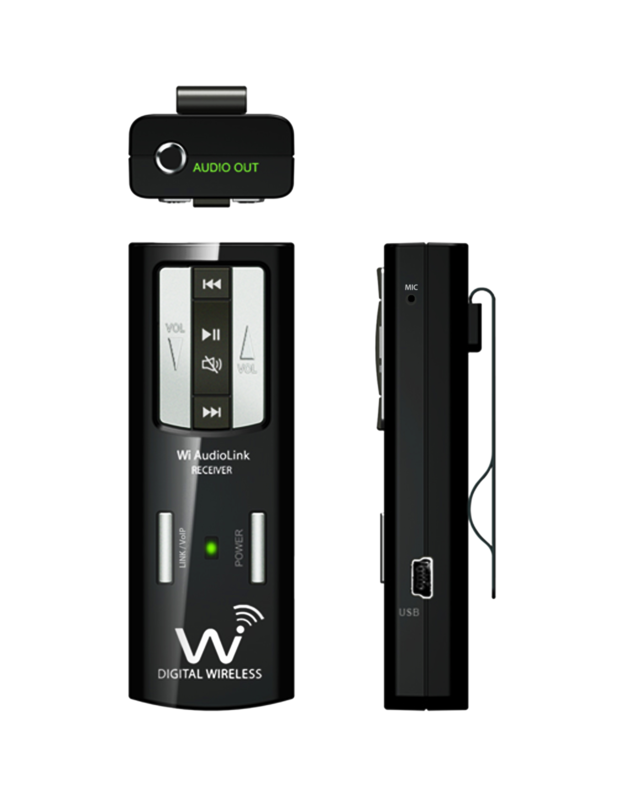 The Wi AudioLink™ Ui Pocket Portable Stereo Digital Wireless System is the first stereo digital wireless audio system ever to combine all the features required for iPod, iPad and iPhone wireless docking, DJ, virtual instruments, wireless studio audio setups, silent practice, audio monitoring, Skype, movies and gaming applications in a small, rugged, lightweight design. 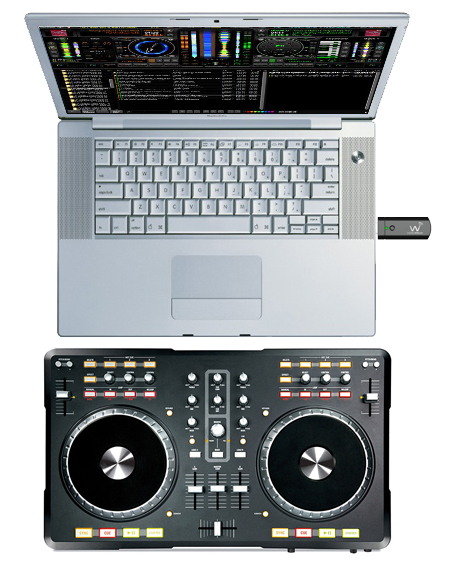 The entire system can fit into the palm of your hand! Weighing only 1.08 Oz, this plug-and-play, visually unobtrusive, rugged wearable system, offers intuitive function buttons and easy-to-read LEDs that display operation mode, power, and battery life status. 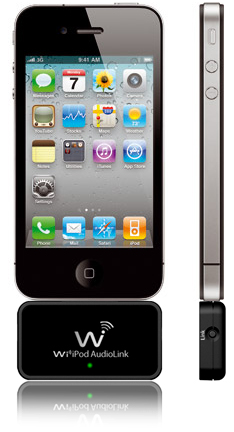 This powerful, dual internal antennas, frequency diversity, 2.4GHz stereo digital wireless system operates without radio frequency (RF) interference inherent in UHF/VHF systems and provides up to 100 feet of secure, uncompressed 16bit, 48kHz CD quality wireless audio connectivity with wide 15Hz to 20kHz frequency response that delivers crisp highs and thundering low tones that will satisfy the most demanding musicians. 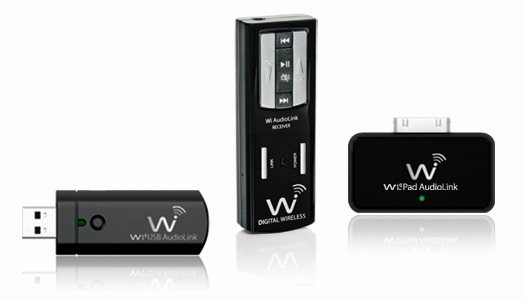 The included plug-and play Wi Pad AudioLink and Wi AudioLink USB stereo digital wilreless audio transmitters are designed to wirelessly integrate your iPod, iPad, iPhone MAC, PC and TabletPC on stage, in your studio or at home with your musical gear. 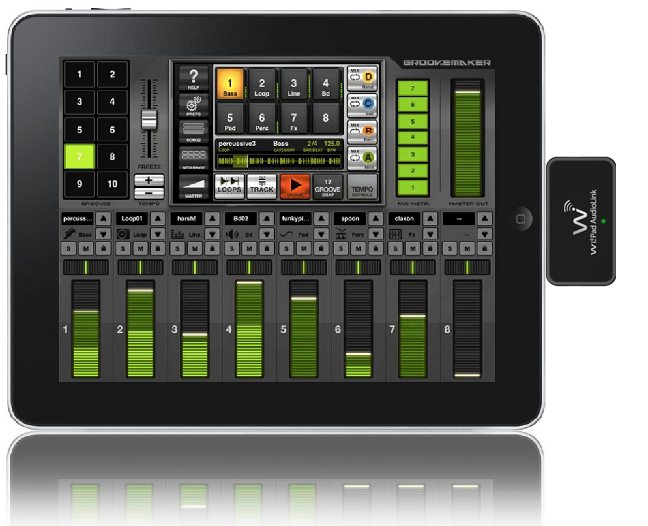 This dynamic wireless docking solution puts all of your iPod, iPad, iPhone, MAC, PC and TabletPC essential audio controls including volume, mute, track control, in the palm of your hand. 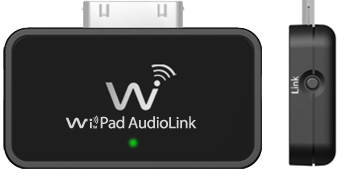 The AudioLink receiver features a built-in high quality microphone that enables you to conduct wireless Skype calls or Podcasting from your MAC, PC or iPad with your favorite headset or in-ear monitor while placing all of the essential audio controls including volume up and down, play, pause, mute and track control in the palm of your hand. 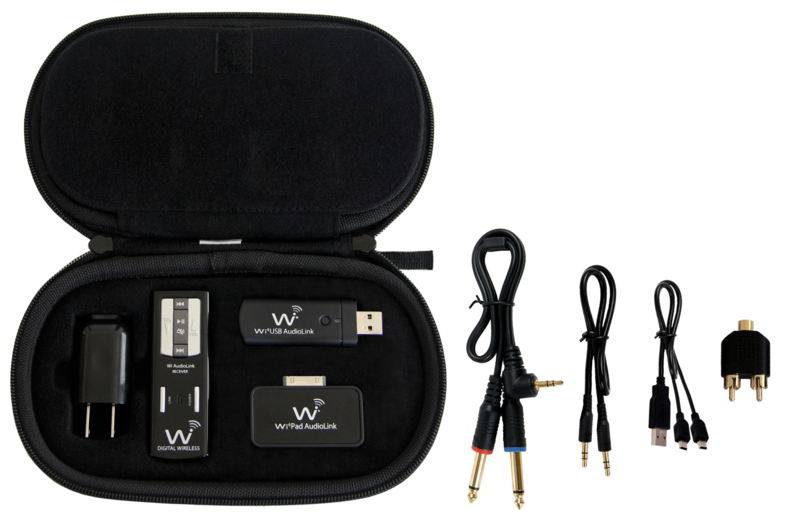 Ideal for iPad/MAC/PC games; movies; music; with support for common calling applications including Skype®, Yahoo!®, Windows Live™, and AIM®. 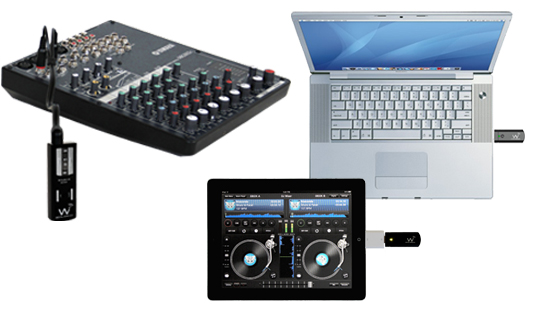 This combination of simplified setup and portability lets you set up quickly and easily! 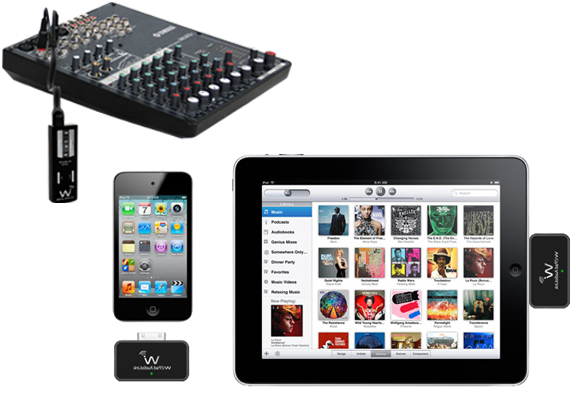 Transmitter Dimensions: 2.1" x 1.2" x 0.44"
Transmitter Dimensions: 2.8" x 0.44" x 0.98"
Ultimate stereo digital wireless audio docking station for iPod, iPad, iPhone, MAC, PC, TabletPC for customized audio signal routings, on-stage, studio and home setups. Movies, music, gaming and calling applications including Skype®, Yahoo!®, Windows Live™, and AIM®. 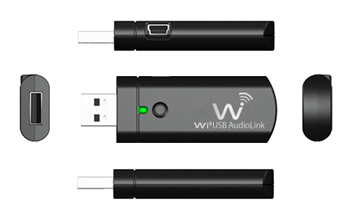 Remote access of all of your iPod, iPad, iPhone, MAC, PC, TabletPC, and Skype essential audio controls including volume, mute and audio track control with the Wi AudioLink receiver.